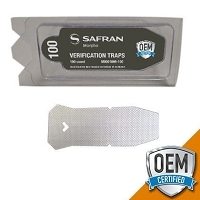 The Sample Swab is an Original Equipment Manufactured (OEM) chemical collection medium which insures optimum detection for use with the Rapiscan Itemiser explosive trace detection machine. For ease of identification, Sample Swabs are stamped with a centered hole. 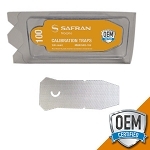 Explosive trace detection swabs are intended for up to 10 sampling events and should be discarded once this level or a qualifying event, as identified in your user manual, is reached. 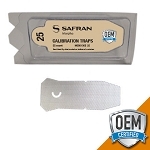 In order to maximize the longevity of this product, the container should be securely closed immediately after obtaining the required trap. New plastic clam-shell packaging allows for easier swab access. The 100-count packaging is ideal for the higher use environment. The material used for Rapiscan Systems' (previously Morpho Detection) Sample Traps is a high-quality Teflon® coated fiberglass optimized for use in Rapiscan trace detection equipment, including the Itemiser DX. Sample Swabs are manufactured and tested under strict laboratory and quality controls in order to ensure the proper functionality of Rapiscan (previously Morpho) trace detection equipment. Hand swabbing has become more prevalent in recent years at airport passenger security checkpoints. On a random basis, passengers will be selected to undergo an additional, non-invasive screening protocol whereby the screening agent will rub a Rapiscan Sample Swab across the palm of the passengers’ hands and place it inside the Itemiser DX Explosive Trace Detection unit for reading any signs of explosive residue. The Rapiscan Sample Swab is a superior medium for utilization in this process given its OEM origination, ease of use and proven track record of reliability. Itemiser DX explosive trace detection equipment, which is used both in commercial industry and government settings such as airports (TSA), CCSP air cargo screening facilities, and military bases, has been a recognized leader in the ETD Explosive Trace Detection field for nearly ten years.